The joy of living with horses can be illustrated in many ways. 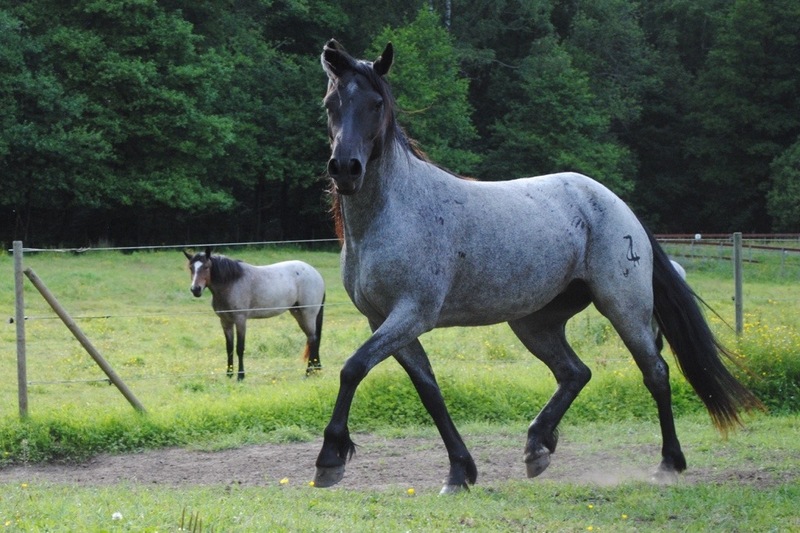 This is Bluebell Star our blue roan Nokota mare trotting the perimeter of her pasture one beautiful summers day earlier this year. By coincidence, Zane Grey, the author of “Valley of Wild Horses” published in 1927, actually wrote a piece that fits almost exactly as a description of Bluebell, our joy of life. So I must share this quote with you all. The set involves a wild horse roundup back in the eighteen hundreds and it seems like the horses had a fair chance to get away, which feels more appealing. This entry was posted in Books, Horse coats, Our horses, Thoughts and tagged horse, nokota, photography, Roan, Weekly Photo Challenge. Bookmark the permalink. Your horses are so beautiful. As an artist, they are inspirational to me. Thanks for liking my post! Love the photography-these horses are beautiful! Open Letters: What do YOU think about BLM Advisory Board’s Recommendation to Slaughter 45,000 Innocent Wild Horses?